Hi, I'm Trainer Kami. I'm a certified nutritionist, yoga instructor, and personal trainer, and I've been helping people lose weight and get into the best shape of their lives for the last 10 years. I've shown thousands of people how to shed pounds in order to achieve their dream body and one thing never changes: Nutrition Is The Key to Weight Loss. But for so many of my clients, nutrition is the BIGGEST struggle. It's nearly impossible to cut calories, get the nutrients you need, and feel full and satisfied. If you're anything like the average American, you don't get enough fruits and veggies, you overeat all the wrong foods, and you're not getting the nutrients that your body desperately needs in order to function at peak capacity for weight loss. Like many of my clients you need a quick and convenient option that will help you lose weight. Meal replacement shakes are the perfect solution. But many of my clients wanted a natural meal replacement shake that was also filling, delicious, effective, and affordable. Unfortunately, this "unicorn solution" just didn't exist. There was no "natural" meal replacement shake out there that fit all the requirements and that I felt comfortable recommending to my clients. That's why I teamed up with IdealShape to create IDEALSHAKE SUPER! IdealShake Super is designed for weight loss with a natural twist. It has everything you need to lose weight, plus more! - Naturally sweetened and flavored. - Only 110 calories per serving. - 12g of protein and 5g of fiber. - A delicious, natural taste. - $1.67 per meal or less! What Makes IdealShake Super, Super? IdealShake Super is a weight loss meal replacement shake that is naturally sweetened with STEVIA, contains natural flavors, is full of naturally satiating ingredients, and is packed with 7 different superfoods to help you maximize your nutrition and your weight loss. I wanted to create a shake for people who wanted a natural meal replacement option. That's why IdealShake Super is sweetened with STEVIA, a natural, zero-calorie sweetener. And even though IdealShake Super is only 100–110 calories per serving, it's packed with 12g of whey protein and 4–5g of fiber to help you feel fuller longer. With 7 different superfoods built right in, you'll get a boost in nutrients and antioxidants. With superfoods like spinach, kale, blueberry, and wheatgrass you'll be feeling healthy from the inside out all while dropping pounds with this natural superfood shake! Losing weight with IdealShake Super is simple. All you have to do is replace 1 to 2 meals a day to start experiencing natural weight loss. IdealShake Super is sweetened and flavored naturally. We use STEVIA zero-calorie sweetener for the perfect amount of sweetness without all the calories. Because we use STEVIA IdealShake Super only has 1g of sugar to help you keep your sugar intake low and avoid energy spikes and crashes. That's because unlike sugar, stevia will have a much lower impact on your blood glucose levels. 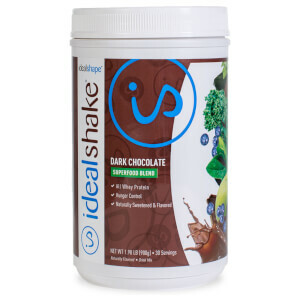 IdealShake super is also naturally flavored with real ingredients like cocoa powder for a delicious, light taste that won't leave you feeling heavy or weighed down. Hunger can stop your weight loss progress dead in it's tracks. So many of my clients have tried to lose weight over and over again only to fail without any idea why. Fad diets that slash your calories but don't address your hunger are a recipe for failure, not weight loss. If you can't control your hunger you can't lose weight. It's as simple as that. Hunger leads to cravings, overeating, and eating way too many calories. Diets that leave you starving and ready to not only jump off the wagon but also burn it to the ground aren't going to help you achieve the long term weight loss results you're looking for. That's why we've included ingredients that naturally fill you up and help you feel full. With 12g of whey protein and 5g of fiber you'll feel full and satisfied after every shake. That's because protein and fiber are both slow digesting nutrients to keep you feeling full, longer. Not only will you be cutting calories to cut pounds, you'll feel full enough to stick to your healthy eating plan and actually see results. With 7 different superfoods we've built a boost of nutrition right into the formula! IdealShake Super is perfect for when you don't have time or resources to make a smoothie complete with greens and vegetables. On-the-go, at work, or when you're low on time – now you can enjoy a meal replacement shake that's packed with nutrients and antioxidants anytime or anywhere! - Spinach – High in antioxidants, potassium, manganese, zinc, magnesium, iron, and calcium. - Kale – High in vitamin C, vitamin K, and vitamin A. - Flaxseed – Keeps you feeling fuller longer and helps with digestion. - Blueberry – High in antioxidants. - Parsley – Improves digestion. - Apple pectin – Keeps you feeling fuller longer. - Wheat grass – Rich with vitamins and minerals to support general well-being. IdealShake Super is sweetened with STEVIA. A zero-calorie sweetener from natural sources that provides the perfect amount of sweetness but without the calories. Even though IdealShake Super only has 110 calories per serving it helps you feel fuller longer with naturally satiating ingredients. 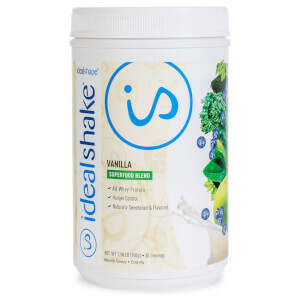 IdealShake has a light, delicious flavor that isn't too rich and won't weigh you down. At only $1.67 per serving, it costs less than your average fast food meal. See Who's Loving IdealShake Super! "I really like the new Chocolate SuperShake! It taste delicious and the texture is really smooth. I also love that the superfoods are already added in. The convenience factor is great!" "I love the IdealShake Super! Such an easy and convenient way to add superfoods to my diet. Can’t believe I get 7 superfoods in each shake! It’s perfect for my on the go lifestyle, so filling, and tastes so yum!" Weight loss is 80 percent nutrition! So if you don't get your nutrition in line with your goals you'll never be able to see the kind of weight loss results you're dreaming of. With IdealShake Super all you need to do is replace on or two meals a day as part of a healthy lifestyle to start seeing results. With IdealShake Super you'll replace a meal that would typically be high in calories with a healthy, delicious shake that supports your goals. IdealShake Super is a natural option for weight loss. Get yours today to start seeing amazing results naturally! IdealShape Protein Blend (Whey Protein Concentrate, Whey Protein Isolate), IdealShape Superfood Blend (Blueberry Powder, Apple Pectn Powder, BevGrad (Flax), Spinach Powder, Parsley Powder, Cracked Cell Chlorella, Kale), Cocoa Powder, Isomalto-Oligosaccharides, Sunfower Oil Creamer, Calcium Carbonate, Natural Flavors, Salt (Sodium Chloride), Magnesium Oxide, Ultrasmooth (Ticaloid), Ascorbic Acid (Vitamin C), Stevia Extract, Vitamin E, Biotn, Potassium Chloride, IdealShape Digestve Enzyme Blend (Bromelain, Papain, DigeSEB, Lactase), Vitamin A Palmitate, Niacinamide (Niacin), Calcium Pantothenate (Pantothenic Acid), Electrolytc Iron, Zinc Oxide, Cholecalciferol (Vitamin D3), Pyridoxine HCl (Vitamin B6), Thiamine Hydrochloride (Vitamin B1), Ribofavin (Vitamin B2), Cyanocobalamin (Vitamin B12), Folic Acid, Potassium Iodide. Stevia is a natural, zero-calorie food sweetener that has been linked to increase insulin sensitivity. Stevia will have a much lower impact on blood sugar than actual sugar. What Superfoods Are in IdealShake Super? Spinach – High in antioxidants, potassium, manganese, zinc, magnesium, iron, and calcium. Kale – High in vitamin C, vitamin K, and vitamin A.
Flaxseed – Keeps you feeling fuller longer and helps with digestion. Blueberry – High in antioxidants. Apple pectin – Keeps you feeling fuller longer. Wheat grass – Rich with vitamins and minerals to support general well-being. Will IdealShake Super Help Me Lose Weight? IdealShake Super is a meal replacement shake designed to help you lose weight. It only contains 110 calories. Replace 1 to 2 meals a day with an IdealShake Super as part of a healthy lifestyle to experience amazing weight loss results!